Tabbouleh salad, the Lebanese way! Healthy, flavorful, and gorgeous side dish. Pairs well with chicken, fish, or even steak! Pour boiling water over the bulgar, cover and set aside for about an hour while the rest of the salad ingredients come together. 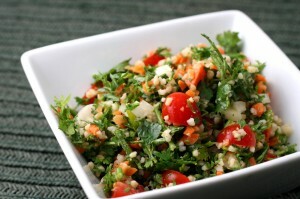 Combine the lemon juice, olive oil, salt, herbs, carrots, cucumber, and tomatoes in a bowl. Stir gently. Cover and store in the fridge to let flavors set. Combine the bulgar with the salad ingredients.